Dodge re-enters the compact-sedan arena in a big way with the all-new 2013 Dart. Based on a modified Alfa Romeo platform, this stylish 4-door matches a youthful appearance and outstanding interior space with multiple trim/powertrain choices, extensive personalization potential, and numerous class-exclusive convenience and safety technologies - all complemented by an equally impressive pricing schedule. 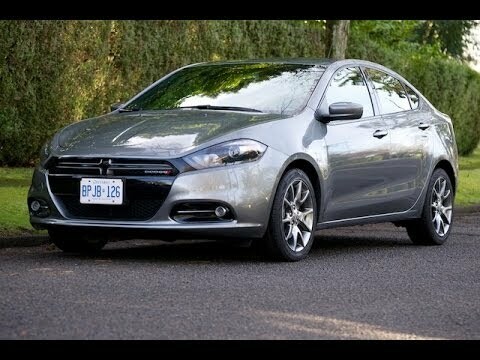 Dodge dart - great gas mileage and performance. My Dodge dart is a amazing car. I average 33-36 miles per gallon, which is amazing. My daily commute has me driving approximately 200 miles per week not counting any additional stops or errands before or after work. I also drive to my parents’ house frequently, which is approximately 200 miles round trip away as well. The fuel consumption is a huge factor for me to purchase this car. It is also very comfortable to drive. I can comfortably fit 2 adults in the back seat without a problem. I travel frequently all around the state of Illinois for order of the eastern star meetings and events. When traveling with others, I am usually the driver and we take my dart. It is great that we can fit 4 adults in the car without a problem along with all of our bags – especially our dress clothes lying flat in the trunk. We also appreciate that I can fill up the tank and unless we are stuck in major traffic or construction where we are at a standstill, we can make the trip – home and back – without having to stop and get gas. This is a huge advantage when you are traveling late at night. There is also a lot of get up and go in the engine. I do not have the turbo, which my husband wanted, but it still has a lot of great pick-up as you are entering the interstate or any busy road. I have over 117,000 miles on it and I haven't had any major issues. I even still have the original brakes! If you do all the basic maintenance this car will run forever I think. Excellent commuter car awesome gas mileage! This car is an excellent car! I have really enjoyed all of the features that it has. I do have two children, that is the downfall of this car. Their car-seats take up a lot of room for the small backseat. Yes, the backseat is very small. My husband and I are tall people so we have to have the front seats scooted back. Which makes for cramped spaces in the backseat. My husband mostly drive this car to get back and forth from work. It has great gas mileage! That is one of the best things about things about this car. The very best feature in my opinion this car offers is the backup camera. If you have kids, the backup camera is excellent! We live in a rural area, which makes it hard in the winter time. Yes we do have a truck but this car being the main commuter car, snowy slick roads are difficult. This car does not do as well as I personally would like it to do. As long as your driving responsibly the winter roads are not to bad. You do need to take your time. It does get stuck which most cars do so keep that in mind. My husband custom ordered this car in 2013, it has been a wonderful car for us! It really has great features & also runs great if you take care of it! The car with a unique look, and cool custom colors everyone will like. My Dodge dart is reliable car and it has great gas mileage and it is a 4 cylinder car. When I first bought the car it had a year free of Sirius radio, and the sound system within the car is really good. There is no Bluetooth connectivity however it does have an AUX cord that easily connects to your phone, or mp3 players. The comfort of the car is perfect for a family of three, the trunk allows you to store enough for a vacation. Under the passenger seat it is an extra storage bin to help store additional things. Rear defrost and standard features are featured in the car. however, the only problem I had with a car was the check passenger seat belt light comes on and I have taken to a dealership and they were still unable to find the problem because the computer system was crashing when they tried resetting it. Other than this my car is still running smoothly and I do not plan to get rid of it. Chrysler Group LLC (Chrysler) is recalling certain model year 2013 Dodge Dart vehicles manufactured March 1, 2012, through February 28, 2013 and equipped with a 1.4L MultiAir turbo engine and dual dry clutch transmission. These vehicles may experience an engine stall when the temperature is 20 degrees Fahrenheit or colder. Chrysler will notify owners, and dealers will reprogram the powertrain control module, free of charge. The recall is expected to begin in July 2013. Owners may contact Chrysler at 1-800-247-9753. Chrysler's recall campaign number is N32. Chrysler will notify owners, and dealers will inspect the brake booster grommet for the presence of oil. If no oil is found, the vacuum tube assembly will be replaced. If oil is found, the vacuum pump, vacuum tube assembly, brake booster and master cylinder will be replaced. Parts are not currently available to remedy the vehicles. Owners will be sent an interim notification and then will be sent a second notice when remedy parts are available. The manufacturer has not yet provided a notification schedule. Owners may contact Chrysler customer service at 1-800-853-1403. Chrysler's number for this recall is R63. Chrysler Group LLC (Chrysler) is recalling certain model year 2013 Dodge Dart vehicles manufactured May 10, 2013, through August 24, 2013 and equipped with the Mopar 13 trim package. In the affected vehicles, the front seat mounted side airbags (SAB) may not have been properly installed into the seat. In the event of a crash necessitating SAB deployment, the SABs may fail to deploy as intended, increasing the risk of injury. Chrysler will notify owners, and dealers will inspect the SAB installation and re-install them as necessary, free of charge. The recall began on December 19, 2013. Owners may contact Chrysler at 1-800-853-1403. Chrysler's recall campaign number is N61. Chrysler will notify owners, and dealers will replace the affected brake calipers, free of charge. The recall began on April 29, 2013. Owners may contact Chrysler at 1-800-247-9753. Chrysler's recall campaign number is N21.